56 Sage Street is a free, online, single-player money-management game built around an interactive virtual city developed by Barclays. The big, Flash-based game is intended to help the European banking giant reach younger consumers. 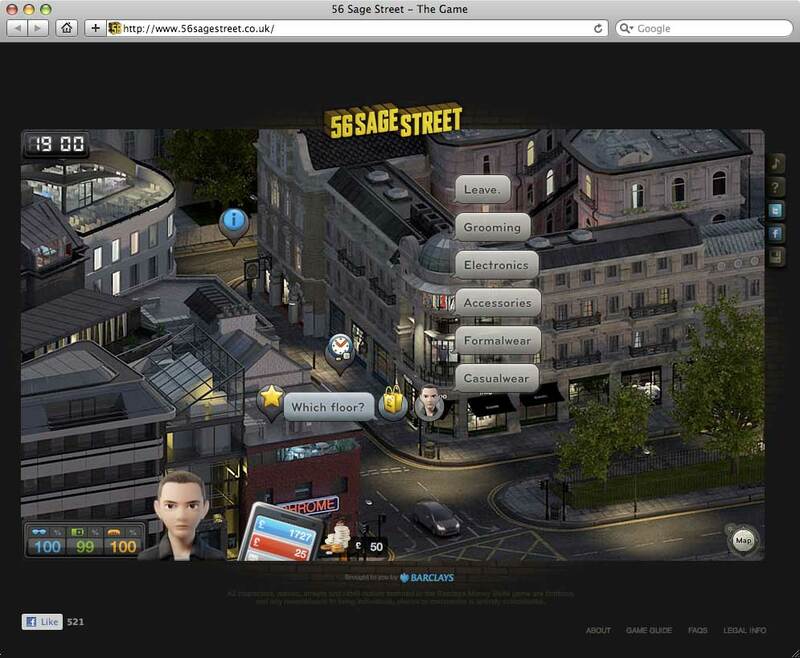 Barclays has introduced 56 Sage Street, a free, online, single-player money-management game built around an interactive virtual city. The big, Flash-based game is intended to help the European banking giant reach younger consumers. When 56 Sage Street begins you have just arrived in the city, with only £4 in your pocket. You make money by taking various jobs, but you have to start out with lowly positions like dish washer and pizza deliveries. You can’t get any of the really good jobs until you improve your appearance and reputation, which takes nicer clothes and a fancier apartment, which, of course takes more money. Therein lies the challenge. The game is named after the address of the fictional Mr. C., an ailing millionaire who lives at 56 Sage Street within the make-believe city. If you complete all the tasks in the game, Mr. C promises to bequeath his empire to you. The game board is a sizable, scrolling, left-to-right three-dimensional map that you explore with your character. You start out in the poorest part of town and advance your way through a total of four “levels” as you accrue more and more money, ultimately ending up in the swanky subdivision called Silvergate. In total, there are some 100+ interactive nodes in the game, including hotels, restaurants, night clubs and various other businesses. Playstation game called “The Getaway,” will likely appeal to younger players. This map only shows 16 of the some 100+ interactive “hot-spots” one can explore. One interesting aspect of 56 Sage Street’s game play is the game clock. Every day, you wake up at 8:00 a.m. The clock advances 15 minutes every time you visit one of the city’s interactive nodes, no matter what you do (or don’t do) at that location. Additional time is run off the clock for jobs you accept and tasks you complete. Every day ends at 11:30 p.m., at which point you must find a hotel, apartment or park bench and rest until 8:00 a.m. the next day. Your character recharges his or her energy and appearance at varying rates depending on the quality of the accommodations you choose (or what you can afford). There are three arcade-style mini-games within the game. 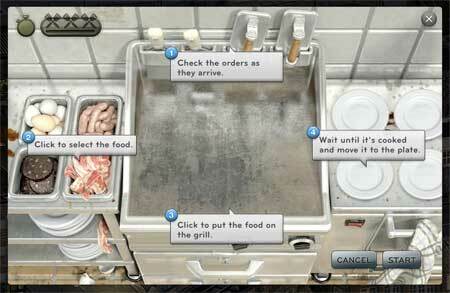 The mini-game in Tony’s Café tests your cooking skills on a short-order grill, the Jolly Roger mini-game tests your reflexes ala Guitar Hero, EWM Solicitors tests your typing skills, and the final secret challenge tests whether you’ve got what it takes to run Mr C’s empire when he is gone. 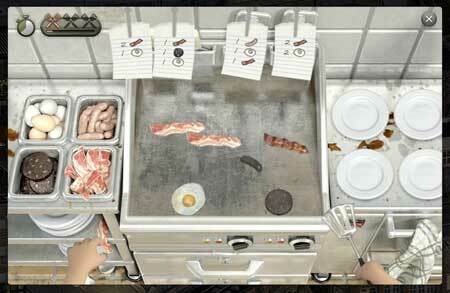 The mini-game in Tony’s Grill (top two images) is a mad race to keep up with the breakfast orders pouring in. 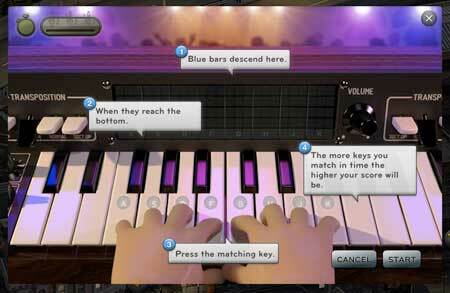 The Jolly Roger mini-game replaces a keyboard for a guitar in a ‘Guitar Hero’ style game. 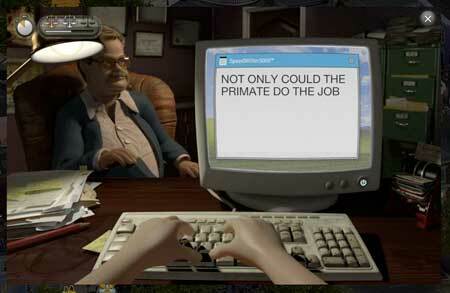 And the EWS Solicitor mini-game is a dictation test. There are 50 different awards you can earn as you play the game, an idea which feels remarkably similar to the kind of badges Foursquare users accrue. 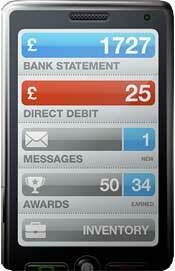 The game includes a mobile phone interface that you can use to help you navigate the game and keep track of your money. If you need any help, there’s a guide for the phone, an overall game guide and FAQ. Anyone registered on Facebook can save their game, and, if you feel like it, share your progress with a status update. There’s also a Twitter tie-in, but it’s relatively weak. The game was designed by international ad agency Bartle Bogle Hegarty in conjunction with B-Reel. 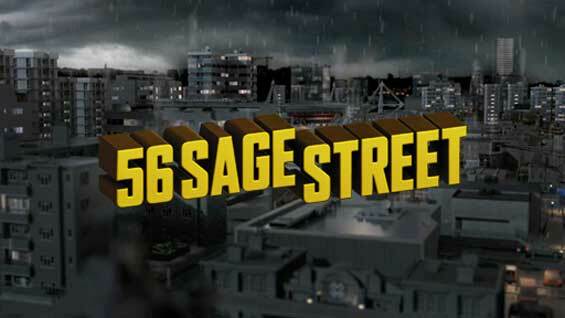 56 Sage Street is not terribly challenging, but it is somewhat fun to play and has the potential to become addictive. Be advised though: If you make it to the end, prepare to be frustrated. If you complete all the tasks Mr. C assigns you, you’re told to go to his house because there’s something he wants to give you. Even though the house is clearly indicated on the game map, the interactive marker appears to be missing, so you can’t win the game. 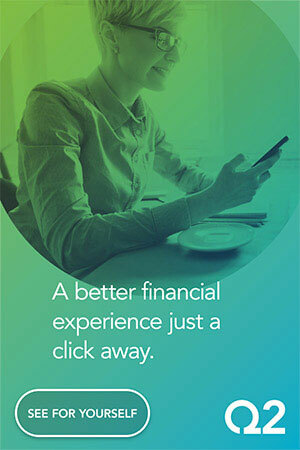 Ultimately the game has a lot more to do with budgeting and money management than it does with banking. Many of the lessons it teaches about how to use a retail financial institution don’t align with how things work in the real world. For instance, you cannot make deposits via your in-game, virtual mobile phone nor online at any of the game’s internet cafes. You can only make deposits in branches… but branches are only open from 9:30 to 5:30 p.m., so if the game clock says 9:15 and you’d like to make a deposit, tough luck: you can’t. What’s worse is that you can only deposit £80 at a time, which is very frustrating when you have a £280 paycheck and £40 in daily automatic debit deductions. It takes “15 minutes” of game time with each visit you make to a branch, plus your energy takes a one-point blow every time you do so. So if you want to make a £800 deposit, you’ll have to make 10 stops at a branch, which takes 2.5 hours of “game time” and 10 “energy points.” The level of irritation this causes is probably a good representation of the vexing “rules” and aggravations consumers have come to expect when dealing with real financial institutions. For all the talk in the financial industry about “engaging young consumers on their terms,” few banks and credit unions truly grasp what that really involves. 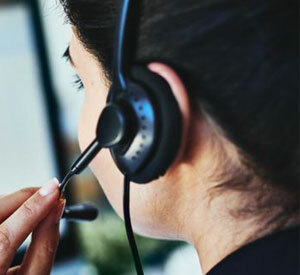 “That means I need to be on Facebook, right?” For most organizations, their youth strategy is little more than lip service, but Barclays is stepping up — nay, stepping out on the ledge — to put its money where its mouth is. At the very least, Barclays deserves praise for its willingness to pioneer and innovate. Financial institutions have been toying with online interactive games for nearly a decade, so in that sense, Barclay’s 56 Sage Street isn’t a new concept. In fact, Barclay’s rolled out another Flash-based game called Water Slides in 2009. What makes 56 Sage Street so remarkable is its size and scope; this free game is almost as good as some that cost money. But the game probably also cost at least £200,000 to develop, plus who knows how much more to promote. Will Barclay’s yield the results necessary to justify this huge roll of the dice? Only time will tell. So far, the game has been “liked” by over 500 people on Facebook, but are these the young people Barclays is targeting? Or are they older video game fans and designers from around the world? Overall, the Barclays brand isn’t very prominent in the game, something sure to please gaming purists as much as it aggravates branding consultants. There is a small, omnipresent logo at the bottom of the screen, but branches within the game’s cityscape are almost completely unbranded. Architectural cues, along with the bank’s signature blue, have been eschewed presumably to preserve the game’s integrity. Little icons of the Barclays crest denote branch and ATM locations. Other than that though, there is almost zero connection back to Barclays or its website. It’s a soft sell at best — perhaps a little too soft — but better for Barclays to err on the side of caution than risk a backlash. After all, if the game reeked of marketing, no one would play it. There is one thing people of all ages will probably realize when playing 56 Sage Street: Life can be very repetitive. You get up, eat, exercise, go to work, eat, come home, eat again, then go to bed. Repeat. Repeat. Repeat. Adults will likely recognize the daily tedium for what it is and acclimate quickly. However, younger people, for whom the game is designed, might find the mundane repetitiveness boring…or worse, downright frightening. Despite the game’s limited value as a banking simulator, the game is a fairly accurate representation of the responsibilities most young people should expect as they enter adulthood. One major aspect of the game isn’t immediately apparent. 56 Sage Street embeds a clear (if not unintentional) message about upward mobility. You’re expected to pursue a bigger, better, more expensive life. The lesson that may make some parents uneasy is that there is no such thing as “good enough.” Your clothes, your appearance, your reputation — indeed who you are as a person — is almost entirely defined by how much money and possessions you have. Happiness, it would seem, is tied directly to your wallet… and always seemingly one step beyond your reach. This article was originally published on July 26, 2010 . All content © 2019 by The Financial Brand and may not be reproduced by any means without permission.